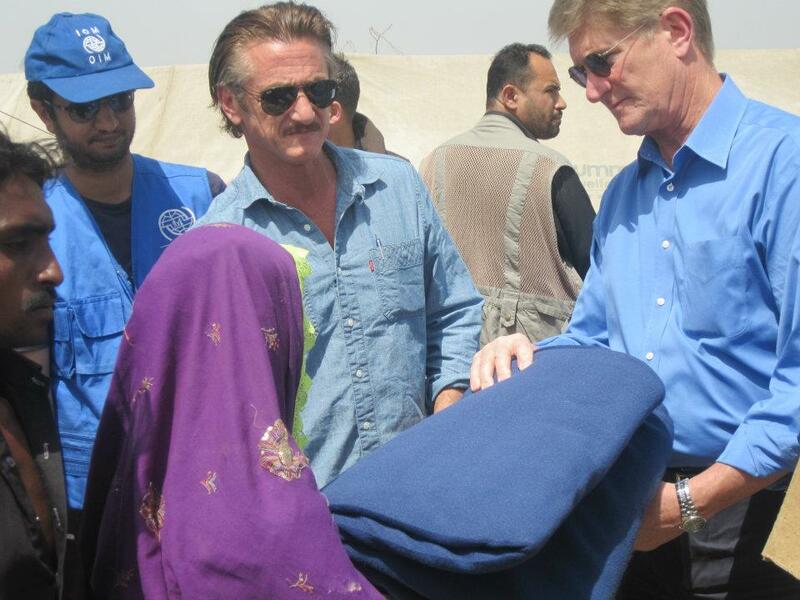 USCG Karachi’s Consul General William Martin and two-time Academy Award winning actor, screen writer and director Sean Penn visited Badin‘s flood affected areas in Pakistan’s Sindh province and distributed USAID provided assistance to people at two camps. Sean Penn won for his roles in Mystic River (2003) and Milk (2008). But no controversy here, Sean Penn reportedly refused to talk to the media, saying that the purpose of his visit was solely to interact with the flood survivors. 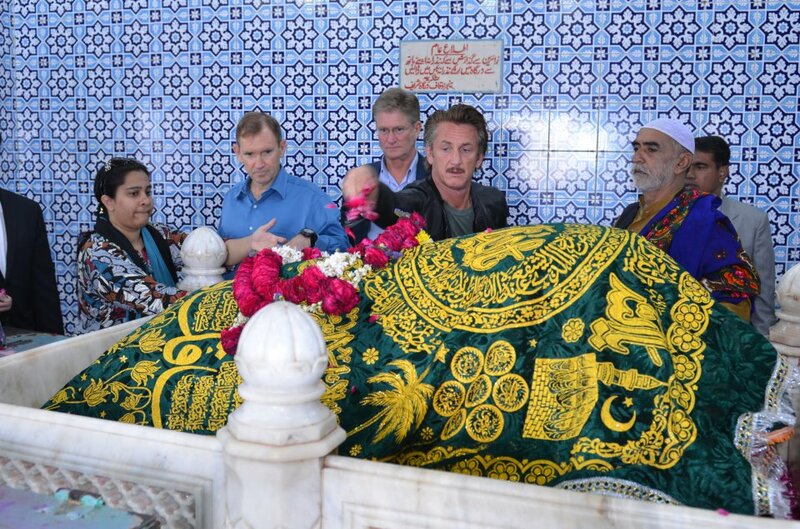 Below Hollywood Actor Sean Penn pays his respects at the shrine of Abdullah Shah Ghazi on March 24, 2012. More photos from US ConGen Karachi here. Those of us who are a little more familiar with Sean Penn’s work figured that he probably came to learn about the place. I was impressed by the fact that he declined to speak to the media, saying that he was there to speak to the people of Badin who were hit by rain-caused flooding in 2011. This was the second year of devastation for the province. Many people are still displaced. Penn met the Kohli people of Badin. They are a tribe which has been mostly ignored in terms of development. There was only one literate man who could converse with Penn, I was told. I am grateful to Penn for visiting at a time when most Americans don’t think of coming here. I blame our government and myself and other privileged people for not helping the Badin people or less privileged. It is not Sean Penn’s job to come and help us if we don’t help ourselves. I just hope that Mr Penn visits again. 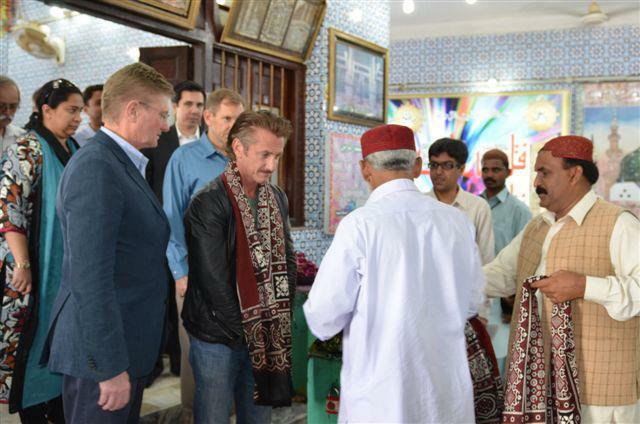 Martin and Penn visited Karim Bux Jamali and Dargah Shah Gurio villages in Badin and handed out blankets, quilts, kitchen items and other goods among the people. Later, they also distributed relief goods to a village near Peero Lashari at Talhar road. Martin, while talking to the media, said that the US has provided goods worth more than $25 million for the flood victims. The USAID has distributed 60,000 emergency shelters in addition to health clinics, which provided medical treatment to over a million people. He added that in the immediate aftermath of the flood, 1.6 million people were supplied water while food was provided to 1.2 million people. An emergency nutrition programme for 16,000 families is still going on, he said. Talking about the relations between Pakistan and the US, Martin said that the relations are slowly being restored as the ‘confusion’ which stemmed from the Salala check post attack dispels. « @United – these poor diplomatic pets, did the merger gut your heart out?